Back in January I entered an online competition organised by top quality outdoor kit manufacturers, Jottnar. To my big surprise I got an email two days later from Tommy at Jottnar congratulating me on winning! What a fantastic prize. 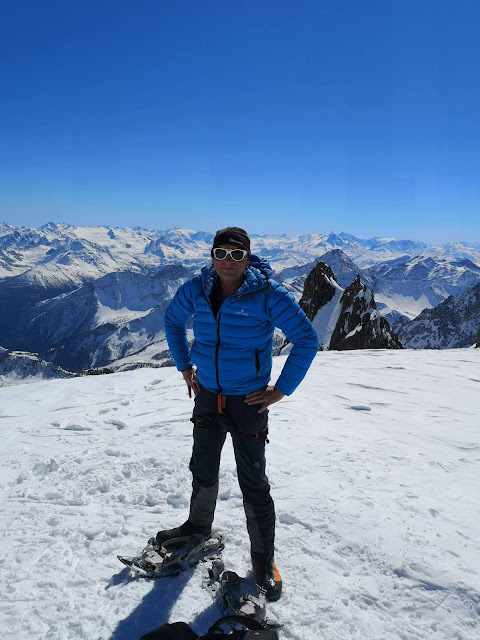 A top end down ski jacket, waterproof mountain/ski pants & 3 nights accommodation in Chamonix for 2 people including two days with an IFMGA guide! A total of £2,400. The fantastic kit I was lucky enough to win was the Ragnarok waterproof down jacket. A top end down filled waterproof ski jacket. The prize also included a pair of the Jottnar Vanir LT Mountain pants. Another superb bit of kit. Tommy had the kit sent to me immediately and sent me details of the company organising the second part of the competition, Adventure Base. Adventure Base are based in Chamonix and they were a joy to communicate with. We quickly had our dates sorted for our mini adventure break in Chamonix. Thanks to Olly who was superb at organisng our trip. Adventure Base run lots of mountain activities so my wife and I chose to have two days on the glaciers around the Mont Blanc area. Our guide for the two days was Pablo. How lucky were we to get such a knowledgeable and experienced IFMGA guide? Pablo is also just a really top bloke to spend time in the mountains with. 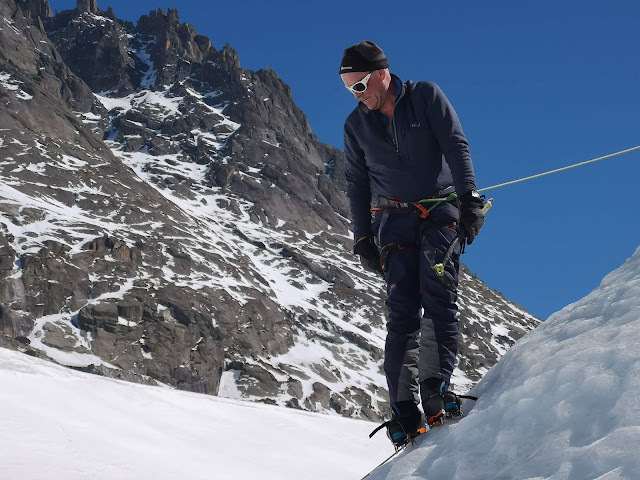 On day one we headed onto the Mer de Glace for some glacial travel and a bit of ice climbing around the moulins with a wonderful backdrop of the Grand Jorasses. Plenty of ski tourers heading down from the Aiguille du Midi, down the Vallee Blanche and ending into the final section of the Mer de Glace. We chose a more leisurely mode of travel, by foot. On day two we headed through the Mont Blanc Tunnel and took the Skyways cablecar up to the Helbronner on the Italian side of Mont Blanc. It was another hot, windless day and fabulous clear skies. We had a day of snow shoeing across the Geant Glacier. 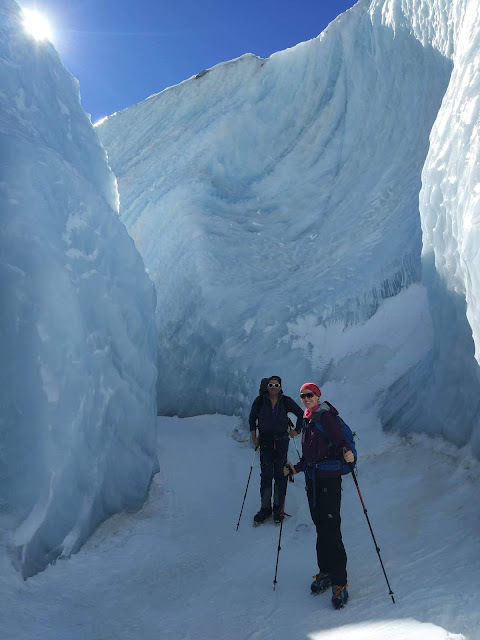 A wonderful tour below the magnificent Grand Capucin where we threaded our way around the crevasses. The weather conditions were a bit unusual for this time of year. 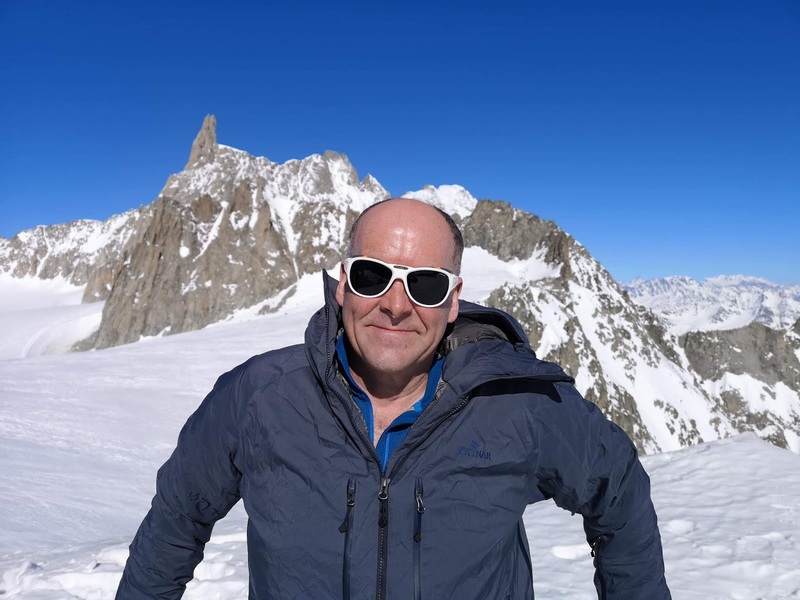 Quite warm up on the glacier so not much chance to use the Rognaruk jacket! The Vallee Blance was once again busy with skiers enjoying the fantastic weather. We escaped all the traffic over toward Mont Blanc de Tacul and below the imposing Brenva Face on Mont Blanc. Here it was solitude and a chance to savour in a quiet corner. We got to our high point of the Col de Entreves before heading back around to the Point Helbronner and our lift down. Another fabulous day with Pablo. We stayed on in Chamonix for a couple more days. Amazing weather throughout. There is still snow on the lower trails and you can still find some nice snow shoeing walks in the area. I had a lovely walk above Montenvers on our last day. The quietest moment in our visit. Grand views of the Drus from here and looking down onto the Mer de Glace. Thanks to Jottnar and Olly at Adventure Base. If you're looking for top quality kit for all your adventures look no further! I have actually bought Jottnar kit before winning this prize! Another big thanks to Pablo Herraez. Highly recommended if you are looking for some climbing out in The Alps. We stayed at the very friendly and comfortable La Chaumiere. See you again in summer Chamonix!